This page includes The First Day Cover Collecting: Spotlighted or in Passing columns from the 2001 issue of Across the Fence Post. This is a continuation of my discussion about add-on cachets. I began addressing the topic within my column that appeared in the October 2000 issue of this publication. Here, I hope to answer the question, "Are label cachets add-ons?" Unfortunately, there's no simple "yes" or "no" answer because label cachets can be both. Once again, it all boils down to when the label was applied to the cover. The matter of label cachets, however, is a bit simpler than that of add-ons, which are printed on covers. Up until a few years ago, label cachets were used primarily on postal stationery. This is because a new stationery item is not available to the cachet maker until the first day of issue. Furthermore, the U.S Postal Service allowed only 30 days to obtain the first-day cancel. Some cachet makers, therefore, found that labels were more convenient. They could be prepared ahead of time and then applied to the postal stationery stock as soon as it could be purchased. This provided adequate time to have the items canceled within the 30-day deadline. Getting back to the differentiation between an add-on label cachet and a non-add-on, it requires absolutely no expertise. Label cachets are not considered to be add-ons if some portion of the first-day cancel at least touches the label. This is called "tying the label to the cover." 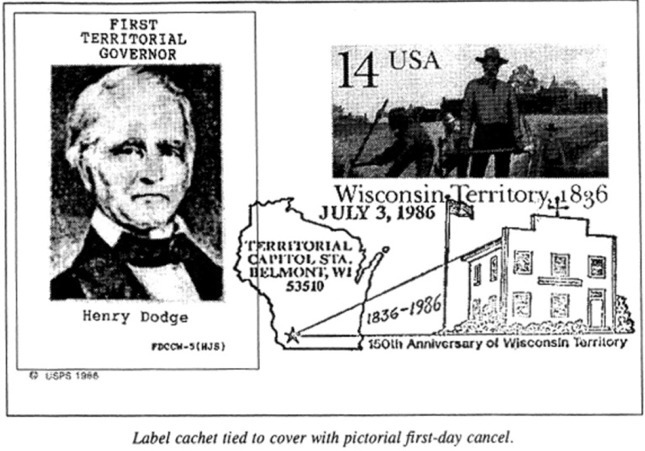 The illustration accompanying this article displays a label cachet that is tied to the cover with a first-day cancel. Generally speaking, labels that are not tied to covers are classified as add-ons, unless proof can be offered that the label was applied before or shortly after being canceled. Some collectors question whether certain commercial silk/cloth cachets are considered to be labels. There's also question about their add-on status. Since these types of cachets probably would not withstand the rigors of the cancellation process, they are generally applied to covers after they have been franked and post-marked. Nevertheless, there are two reasons why they are considered to be neither add-ons nor labels. First, they are usually applied within a reasonable length of time after the cover was canceled, generally within 30 days. Second, they are not just applied with a water-activated adhesive, but are secured to the cover with an adhesive and are also embossed. Examining the inside of the cover can see the embossing impression. With current postal regulations, we're not likely to see as many label cachets, even on covers produced by small-volume cachet makers. This is because the Postal Service now limitedly allows 90 days to obtain a specific first-day cancel. In order to be eligible for the 90-day grace period, cachet makers, servicers, and dealers must register with the U.S. Postal Service's Manager of Operations Office at the Philatelic Sales Fulfillment Center in Kansas City, MO. The FDC collector submitting a few covers for his own use, though, continues to be bound by the usual 30-day period as listed in the philatelic press. I plan to discuss procedures involved with submitting covers for first-day cancels in a future column. 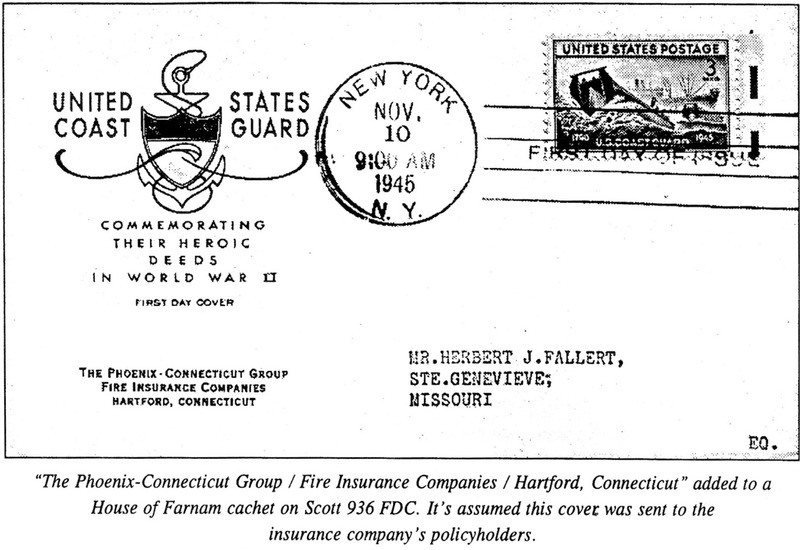 Shortly after I received my first cacheted first-day cover way back in August 1951, I began to think that FDCs would be a good medium for advertising. After all, I had seen or heard advertising in and on just about everything imaginable. Nevertheless, it was not until about 12 years later that I saw a FDC with the name of a business tucked under a well known commercially produced cachet. This goes to show that no part of any avenue destined for public exposure is immune to advertising. Comparing my observations with other FDC collectors, I learned that advertising messages are often found on FDCs. My further observations revealed that the firm doing the advertising is sometimes a business related to the subject of the stamp; sometimes there is no relationship at all. Cachets that convey an advertising message can be classified into three groups. The first is a popular commercial cachet with only a line or two of advertising under the cachet. In this group, you might also find the cachet with just a company logo below it. The second group includes a cachet that has been created strictly for advertising, where the advertising message is usually pertinent to the stamp subject. Charitable organizations have been known to use this type of cachet to promote their fund-raising campaigns, as have political organizations to promote their candidates as well as to request campaign contributions. The third type is when a business will save the expense of a cachet design and use its regular corner card (see ATFP, March 1995, p. 5) or business envelops as cacheted covers. In this case, the business doing the advertising produces a product or service that almost always is related to the subject matter of the stamp on the FDC. To be more specific, when the U.S. Postal Service's Nursing issue (Scott 1190) debuted in 1961, one of the pharmaceutical companies had its drug salesmen obtain the names and addresses of nurses employed in the hospitals on their routes. The company then sent all of these nurses a FDC for that stamp. The covers included Artcraft cachets with the drug company's name located at the bottom of the cachet area. As for rating the collectibility of these covers, that is a matter of choice. There are collectors who regard themselves as purists and would not have a cacheted FDC in their collections that includes any sort of advertising or solicitation, even if threatened with execution. Then there are collectors like myself who consider a cachet with advertising as another variety of cachet to collect. If I am thought to be an archivist (a preservationist of historical artifacts), then advertising, as it ages, becomes more and more historically significant. The Planty and Mellone catalogs list cachets containing advertising as legitimate cachet varieties. This only proves that I am not alone in this type of thinking. It's what you like versus what I like, and there is no real basis for a productive debate. Now that I have said it, pray tell me, what do you have to say? Have you ever tried mailing your first-day covers for servicing only to be disappointed with the results? Perhaps the information given below and in succeeding installments can decrease the frustration of your next attempt. First, I advise not taking your covers to the first-day ceremony for cancellation. If you send your covers through the mail, they will most likely be canceled at the Stamp Fulfillment Services facility in Kansas City. Their staff is highly experienced in applying cancels and will give you creditable results. I would only take items of a souvenir nature, e.g., programs, maximum cards, photographs, currency, etc., to the first-day ceremony site. You might attempt to apply your own cancels by asking the postal staff at the first-day site if you may do so. If granted this privilege, the canceling must be done in the presence of a postal worker. Always plan your first-day covers well in advance of the actual date of the first day of issue. Have your cachets printed well in advance. If you intend to do hand-drawn cachets, it is best to apply the artwork after the covers have been canceled. I recommend using No. 6 3/4 envelopes of good quality stock (25 percent or more rag content) for your covers. Although not absolutely required, do insert a card-like stiffener that will fill out the envelope. The stiffener should have the thickness of a postal card. My advice is that covers should never be without stiffeners. Their original shape will be better protected. A postal regulation requires that all covers must be addressed. I use white Avery multi-purpose removable labels, size I inch by 3 inches, catalog No. S1648. They are easily removed and don't stain your covers. The labels also can be cut for use in addressing several covers. I've had poor results using removable labels purchased from philatelic suppliers. I usually have a supply of address labels that the DAV and like organizations send me several times a year. Applying these printed labels to the removable labels can save time and writer's cramp. Please do not use a rubber stamp for addressing, be it self-inking or the kind that requires an inkpad. This type of ink will leach through the removable labels and stain your covers. The address label must be applied to the lower right corner of the cover, but about three-quarters of an inch from the bottom and right-hand edges. Purchase the required stamps at your local post office shortly after the first-day date and affix them to the upper right corner of the cover, one-fourth of an inch from the top and right side edges. For combo covers, you can usually get away with applying the stamps closer to the edges, but leave at least a one-eighth-inch border. I mark the outer envelope with "Do Not Bend." I additionally have a clerk at my local post office hand-cancel the franking. This avoids any possible damage to the package that the canceling machine might inflict. Another stiffener that fills out the No. 10 envelope is also recommended. I further recommend not putting more than 15 to 20 covers in each No. 10 envelope. If you have more than 20 covers that need canceling, they will have to be mailed in several groups. Keep in mind that the Postal Service will only cancel a maximum of 50 covers for one person without a service charge. I also include a SASE with sufficient return postage applied. The Postal Service is not obligated to use this SASE, but so far they have obliged me with its use. Always mark the SASE with "Do Not Bend" and "Hand Cancel." Please remember that you have only 30 days to obtain first-day cancels, but don't wait until the last minute. Allow a margin of safety. Also, when your covers are returned, immediately remove that peelable label. This will further protect the covers from any possibility of label staining.